Building question and answer site was never so easy & Interactive. 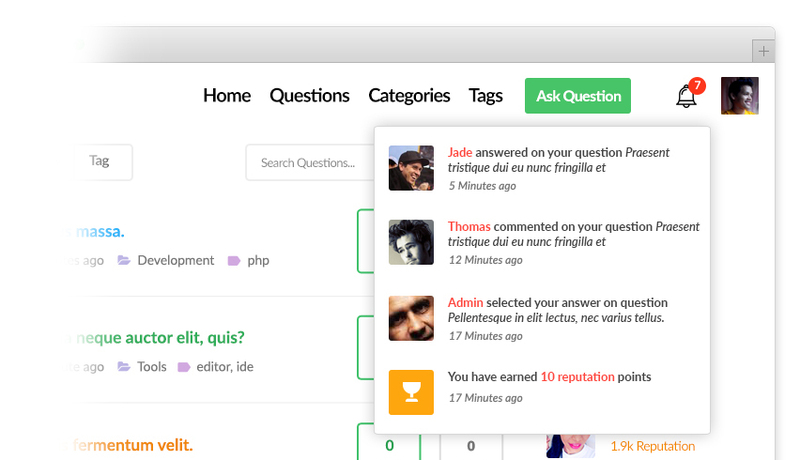 Use it to create a q&a network similar to stackoverflow and quora, or just as a page in existing site. Demo Download Latest Version 4.1.15, Updated September 29, 2018. 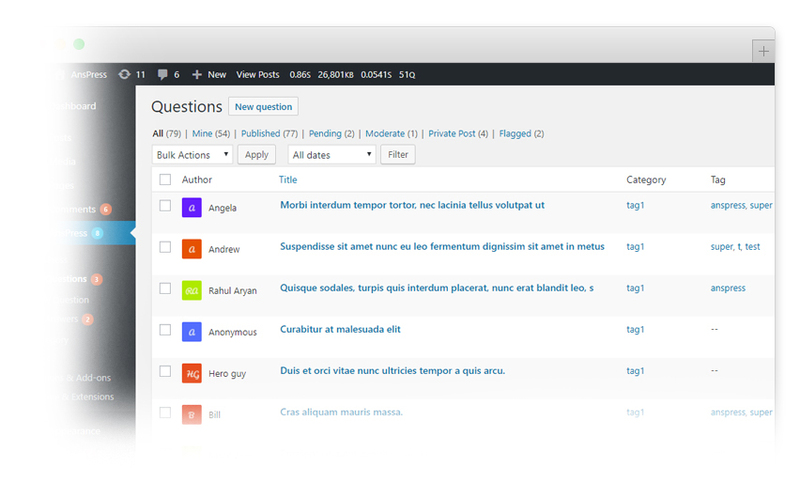 It is an open source question and answer plugin for WordPress. It is built with developers in mind and can easily be extended to fit your needs. All parts of layout templates can be overridden. 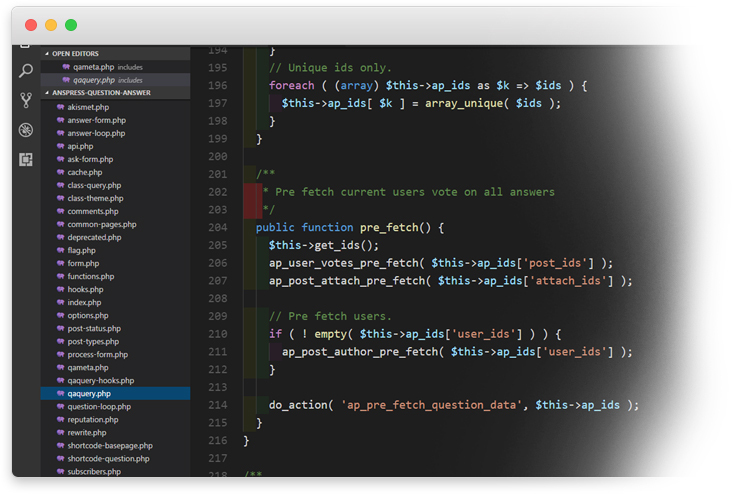 Our source code follows WP coding standards and is properly commented. It is well tested in many different server environments. It runs smoothly on every type of server with minimal impact on load times. Learn more about AnsPress and its background. 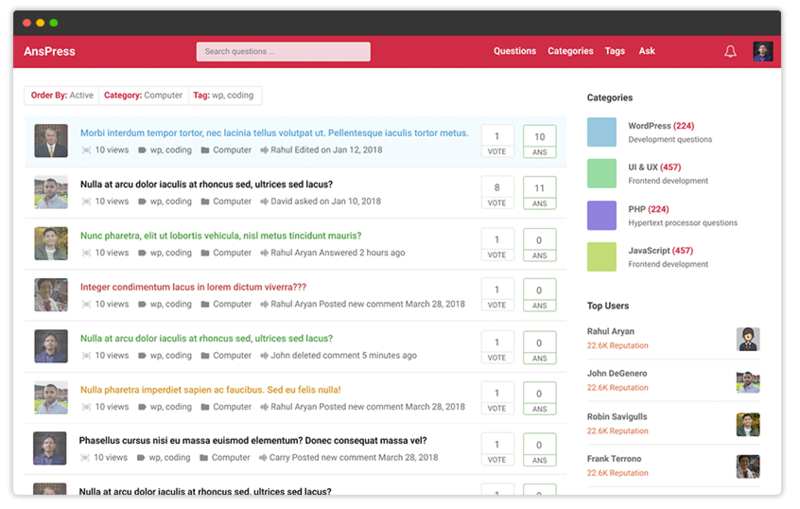 Make questions featured so they stick to the top of list. Let users vote on questions to express their thought for its relevance. Allow asker to select an answer as "best answer". Notify users for various activity happening within AnsPress. Encourage users by awarding reputation/points for their activities. Interactive and beautiful built-in user profile system. 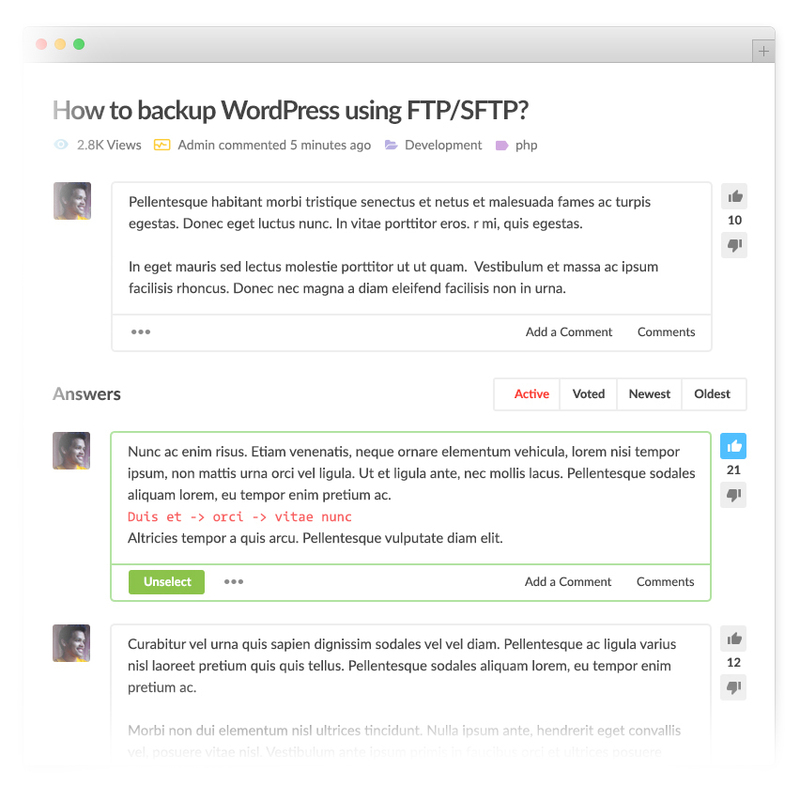 Let users discuss questions and answers by commenting on them. Users can follow questions for receiving question updates. Shows recent activity. All question and answer is shown to subscribers. Allow the community to report inappropriate or spam posts. Create private questions which is only accessible for selected users. Allow media attachments in questions and answers. Send email notification to users when they have an update. Add taxonomy categories for questions (free addon). Add taxonomy tags to questions (free addon). AnsPress is very flexible and can be easily overridden. Easily extend AnsPress using actions and filters. Find out more about customizing. AnsPress notifications will notify users for various activity happening within AnsPress. Notification system is not just limited to AnsPress, it can be easily extended to show new types of activities. Question and answers are search engine optimized. We use schema.org markup for questions and answers. We've tested it with many caching plugins and ensured things are being cached properly. Also spent many hours on improving performance and continuously working to improve it more. We love open source as much as you do so feel free to hack on, play with, poke, prod, and extend and make it your own. Check our GitHub repository. AnsPress UI is very simple and easy to understand. It has familiar UI which is being used in many popular Q&A sites. AnsPress uses Ajax and Backbone.js for performing many frontend actions.